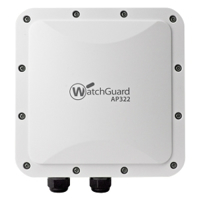 The WatchGuard AP322 is a ruggadised outdoor secure wireless access point with built-in Wireless Intrusion Prevention System (WIPS). Protect your airspace from unauthorized devices, rogue APs, man-in-the-middle and denial-of-service attacks with the WatchGuard Wi-Fi cloud. Engage with your customers through videos, polls or surveys and use the built-in analytics tools to understand their habits and preferences. The WatchGuard Wi-Fi Cloud can be easily scaled from one to an unlimited number of APs across multiple locations. Regardless of whether you deploy the AP322 together with a WatchGuard Firebox for total UTM protection or as a stand alone unit, the Wi-Fi Cloud allows you to analyse metrics such as footfall, dwell time and conversion to drive your business decisions. The AP322 is ideal for stadiums and sports fields, hotel pool areas, open air cafes, warehouses and other harsh environments. Trade Up your old WatchGuard wireless access point or device for a WatchGuard AP322 with 3-yr Wi-Fi Cloud subscription and Standard Support. Trade Up your old WatchGuard wireless access point or device for a WatchGuard AP322 with 3-yr Secure Wi-Fi with patented WIPS. Trade Up your old WatchGuard wireless access point or device to a WatchGuard AP322 with 3-yr Standard Support. WatchGuard AP322 with 1-yr Wi-Fi Cloud subscription and Standard Support. WatchGuard AP322 with 1-yr Seucre Wi-Fi with patented WIPS. WatchGuard AP322 with 3-yr Secure Wi-Fi with patented WIPS.